Lotur the Scurrilous Cur is 3rd level, so he has three hit dice. We imagine each of these as representing a different aspect of his ability to stave off death: mental, spiritual, and physical. Because he was fully healed since his last adventure, we don’t know how many hit points he gets from each dice. Not five feet into the dungeon, Lotur is hit by a gnoll’s arrow and takes six points of damage. The player notes on Lotur’s sheet that he has taken 6 points of wounds, and starts rolling his hit dice to see if he can absorb the blow. If Lotur rolls a 6 on his first (mental) hit dice, it absorbs the wound fully. He crosses out that hit dice – we imagine that he’s run out of plans for dealing with gnoll ambush – and leaves the other two untouched and unknown. Unfortunately, he only rolls a 2. He crosses out his mental hit dice, and has four points of incoming damage left to absorb. He rolls a 1 with his second (spiritual) hit dice: he crosses it out. We imagine that he is demoralized, and still has three points of incoming damage. For his last (physical) hit dice, Lotur rolls a six! He subtracts the three points of incoming damage, and notes that he has three hit points left on this dice. However, at this point we imagine that he is actually bleeding and has an arrow sticking out of him. Oops, here comes another arrow! This one rolls a 2 for damage. We already know that Lotur has three physical hit points left, so he doesn’t need to roll any hit dice. His player crosses off two of the hit points remaining on Lotur’s physical hit dice, and increases his total wounds taken from 6 to 8. Salvation arrives in the form of a cleric. Each point of healing delivered by the cure spell will subtract one from Lotur’s wound total. If the cleric rolls eight or more points of healing, all Lotur’s wounds are erased and all three of his hit dice are reset. However, the cleric only rolls a 3, so Lotur increases the hit points remaining on his physical hit dice from 1 to 4, and decreases his total wounds from 8 to 5. Note that poisoned arrows have to get through to the physical hit dice to be effective, so there’s a benefit of having that dice untouched; and some kinds of healing will add to your spiritual or physical hit dice, but won’t work if those dice have been crossed off. – When a character has more or fewer levels than they do physical/spiritual/mental hit dice, we assign extra or missing hit dice to one of the three categories depending on class. A fighter gets an extra physical at L4, a cleric an extra spiritual, etc. Then spread out until at L6 all classes have two of each. – Once a character’s hit points have all been rolled, these rolls are kept only as long as they have wounds. When all wounds are removed, hit dice reset to unknown. – High constitution provides a buffer after you run out of hit dice. Characters that are tough get 1 HP per hit die of buffer; exceptionally tough characters get 2 per die. So if a 3rd level PC rolled 12 for their HP, a tough one could actually take 15, and an exceptionally tough one 18, before collapsing. This idea was inspired by Zulgyan’s method of rolling monster HD, and realizing that most of the d6’s I have are either red, green, or white, which I assigned to physical, spiritual, and mental. I like this approach because it makes taking damage an exciting dice-roll contest between player and monster. As per Gary’s house rules we’ve started with third level characters, so when a PC is hit by a lizardman spear for 6 damage, there’s a dramatic sequence of rolls: does their knowledge of fencing techniques cover this? No, they roll a 2 for their mental hit dice, so there’s 4 points of damage remaining, and their plan for survival is in shambles. Is their esprit de corps sufficient for them to simply knock the spear aside? No, they roll a 2 for their spiritual hit dice, so there’s still 2 points of incoming damage and they’re demoralized. OK, are they hale enough for them to survive this thrust? No, they roll a 2 for their physical hit dice and die! I also like the way that doing this helps imagine what different states of being wounded are; it helps systematize the idea that hit points represent divine favor and luck as well as sheer toughness. In play it does take a little longer to resolve PCs taking damage than if players were just subtracting a number from the HP written on their sheet. It did mean that the math involved was a lot easier – take the # of damage dealt, subtract from 1 to 6, repeat. Plus, I feel like the risk of a player dying is worth spending extra spotlight time attending to, and I like how not knowing what your hit points are before they’re tested means that every wound carries the possibility of death. If a 3rd level character rolled a string of 1’s for their hit dice and was going to be stuck with that forever, I’d certainly let them re-roll, but this approach means that although such bad luck might mean your character gets sent to the graveyard, it doesn’t mean that you might as well roll up a new one even before they start adventuring. Like many DMs, I’ve implemented a house rule allowing PCs to survive when their hit points drop to zero. But does this really help the party? 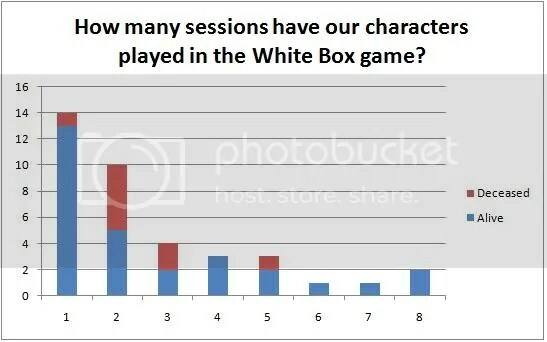 The player base in my Red Box game has expanded significantly over the past few months, so we generally have 6-9 players per session. As I divide experience points evenly between all surviving PCs at the end of a session, lots of surviving PCs means only a few experience points each. Characters only tend to get sizable lumps of experience when most of their fellow PCs die, such as when the inimitable Hamish was the sole survivor of a trek into what has since been dubbed the Swamp of Death. Last session, six PCs entered the dungeon, and two of them dropped to zero hit points but survived. The party received a total of 715 XP. Divided six ways, that’s 119 XP each. Had both of the incapacitated PCs simply died instead, the remaining four PCs would have received… 178 XP each. Hm. A piddly 59 XP is hardly a worthwhile gain for the survivors. 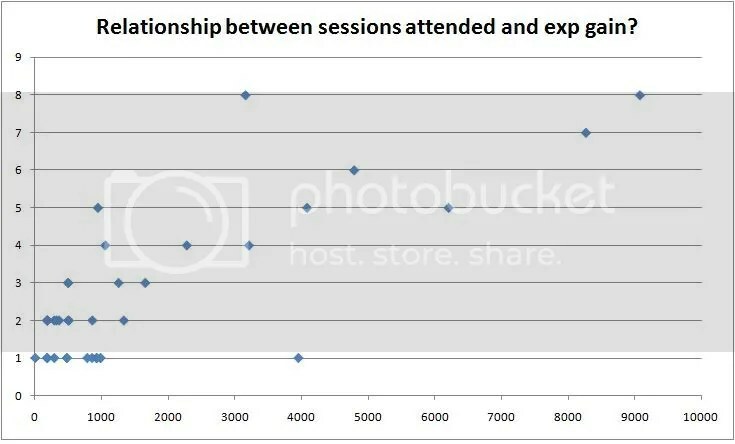 Meanwhile, the two incapacitated PCs had 780 XP and 252 XP respectively; not a lot, but significantly more than that 59 XP differential. I have an admission to make. It’s a shameful one for someone running an old school D&D game, but here it is. None of my PCs in ongoing games have ever died. I’ve been playing RPGs for years, starting with Blue Box Basic back in 1978 or so. My memory of play back then is rather vague, but given our tender age and low attention spans, I don’t think my friends and I tried anything more than one-offs. My friends and I dabbled in other games, such as Traveller, Top Secret and Star Frontiers, none of which lasted long. A group at the local youth center, run by a fellow who seemed ancient to us but was likely a college student or even a high school senior, entertained us with his own brand of AD&D; my eighth-level ranger, his name lost in the mists of time, still survives somewhere, albeit permanently blinded from a nuclear strike on the Great Kingdom of Aerdy. As a result of this unprecedented feat of survival, I feel some perplexity when faced by the massive death tolls of our group’s old school games. How do my players actually feel when their characters are impaled by bugbears, rent asunder by zombie wolves or incinerated by their own arsenals of ersatz Greek fire? Yes, many of them seem quite sanguine about their characters’ fates; certainly my fellow bloggers have had more than their share of deceased PCs and they show no signs of slackening in their resolve to come back for more. But the actual sensations involved escape me. Hands-on research is clearly required. But I like my characters and have no wish to kill them off merely for experimental purposes. And in any case, deliberate suicide would seem to defeat the purpose. This is something that should happen naturally, despite all my paranoid in-character behavior. – Jumping to conclusions. Our plan was to visit Sebastian, one of the necromancers in the Caves of Chaos with whom we’d previously made a treaty. When we arrived no one was waiting at the mouth of their cave, it took a while for them to respond to our hail, and there were noises of things moving around inside. I interpreted this as evidence that the necromancers were under attack and that we could take advantage of the situation to kill and loot them. It wouldn’t have taken much intelligence-gathering to prove this assumption wrong, but I sailed in with blind faith in my assessment of what was going on. – Roleplaying. Self-preservation is a top priority for rational beings, so arguably it’s poor roleplaying not to act with that in mind. Or, in the “what’s my job in the party” sense rather than “what’s my motivation”, a guy whose romantic ambitions cause him to run into a cave known to be full of zombie guards in order to rescue a medusa who has already betrayed him twice is playing the role of Suicidal Lunatic to the hilt. Good or bad, roleplaying killed Era the Elf Captain of the Dragoon Lancers, the only Red Box character I’ve ever rolled who died in their second session of play instead of the first. – Beer. Some of the mistakes we made were stupid enough that we need an external factor to blame them on. For example, in the first successful (pre-alliance) raid we made on the necromancers, we took two kinds of badges from their slain apprentices. We knew that one of them protected us from the zombies, but went in wearing the other kind of badge. Oops! It was also a big group of players and the place where we play was unusually noisy, so difficulty in communicating and inattentiveness made things worse. – Numbers. When we did establish contact with the necromancers, they offered us 2,000 gold to capture a hawk-bear dwelling in the Caves and 3,000 to bring them a bull-man. Our first-level characters shied away from these, suspecting those monsters would have ample hit dice. Instead, we decided to go after the bugbears in the hopes that their numbers would have been thinned out when we defeated their patrol that attacked us while we parlayed with the necromancers. This was foolish not only because the chieftain of those goblinoids probably had as many hit dice, but also because we allowed ourselves to be outnumbered by his forces. If we’d gone after the hawk-bear, we would have been the ones swarming over it – more troops almost always have the edge against a single powerful critter in old-school D&D. We also failed to bring any henchmen, having let the previous ones go over a dispute over whether they deserved full shares on the next expedition. We got hardly any treasure and the henchmen probably would have died before they could claim shares in any case, so in retrospect this was also foolish. – Lack of profit motive. The hawk-bear might have killed as many of us, but the survivors would have gotten paid. We got no cash from our raid on the bugbears. This relates to survival both because making it to second level would dramatically improve our longevity, and because keeping our eyes on the prize would encourage more caution. – Born to die. The loss of Francois, the founder of the Crossed Swords mercenary company, was bitter both because of his vivid presence in the campaign and because he died with almost enough XP to level up. Characters who’d just been created had less to live for, and so having fun rightly took precedence over saving their newly-minted PC’s skin at all costs. One of the two new players we had last night rolled a dismal set of ability score rolls, distinguished by a dismal Constitution and a pretty-good Charisma, and decided that his PC would be an enormously fat and jolly elf. What better destiny could such a character have than discovering the sign on the entrance to the bugbear lair promising a hot meal; running in full of enthusiasm, trust, and gluttony; and being promptly skewered to death? Survival is a drab thing compared to such glories. Another thing last night reminded me of is that we need more handouts. The other one of our new players was a pure drop-in, having wandered over to our table when his Pathfinder Society game didn’t materialize, and we should definitely have had stuff to get him up to speed (a one-page guide to character generation, another on how to use the basic Red Box rules – as a 3E-era player knowing the mechanics was important to him – and finally the one-page distillation of Matt Finch’s Quick Primer for Old School Gaming that I found somewhere) and plugged into the larger network of gaming (something better to point to our online presence than the napkin scrap on which we wrote the New York Red Box URL, and a TARGA flyer once such exists).